Twenty-two years is a ripe old age for an opera production nowadays. Production styles date quickly; were the idiotic description ‘timeless’ not already shop-soiled before it tripped off the tongue, it soon would be in this world. More fundamentally, production concerns will quickly transform too. Such is the nature of our ever-changing world and thus of the theatre which, in varying degrees of the oblique, holds up a mirror to it. 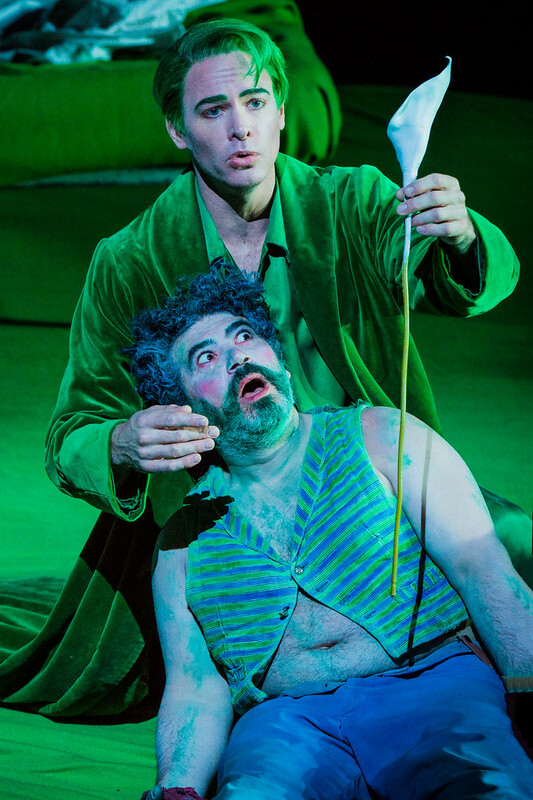 Robert Carsen’s 1995 ENO production of Britten’s A Midsummer Night’s Dream looks fresher than I should ever have imagined. Visits to houses from France to China notwithstanding, it might have been new at the Coliseum this March. I wonder, never having seen it before, how much has been revised and restored. Much, I suspect: that, surely, is the business of keeping a production, of necessity far from ‘timeless’, in the repertory. And there is certainly a case, without that descending into mere conservatism, for ENO to ‘curate’ its repertory of productions a little more carefully than has sometimes been the case in the recent past. A giant bed delimits much of the action’s limits. Such an image can hardly fail to suggest something sexual, although, by the same token, it would be disingenuous to claim too much that is overt, or even covert, in that respect. There is a sense of childlike, or at least childish (not the same, as Britten of all composers would surely have known) play to the proceedings too: such, after all, is how children, at least in their (alleged) innocence, will speak of a bed. Beyond that, the Coliseum space is used inventively, occasionally spilling out beyond the stage, yet never merely for the sake of it, and never to the extent of the wearily predictable. Lighting (Carsen himself and Peter van Praet) is sensitive, revealingly suggestive of different worlds, different times; likewise Michael Levine’s designs. There is an almost ravishing beauty to the proceedings of this Athenian forest, from which it would take a sterner soul than mine entirely to recoil. I certainly saw no reason to do so, and found the first two acts fairly sped by. As for the third, perhaps the problem is mine. There are people who complain about alleged longueurs in Elektra (!) and Der Rosenkavalier, their complete absence (to me) notwithstanding, who find the play within a play riveting, even hilarious. I am afraid I find it all too straightforwardly a ‘tedious play’. Oh well: it does none of us any harm to try to understand what others see and hear in something – and, if we cannot do so, simply put up with it for a while. In any case, Alexander Soddy led a knowing, sensitive, often truly magical account of the score throughout. Its allusions to other scores, other composers were clear enough without underlining. What seems to me ultimately far more interesting in Britten – and that is doubtless as much a matter of my own preoccupations as anything else – is the way he constructs his music. That generative, impulse was equally to the fore here. 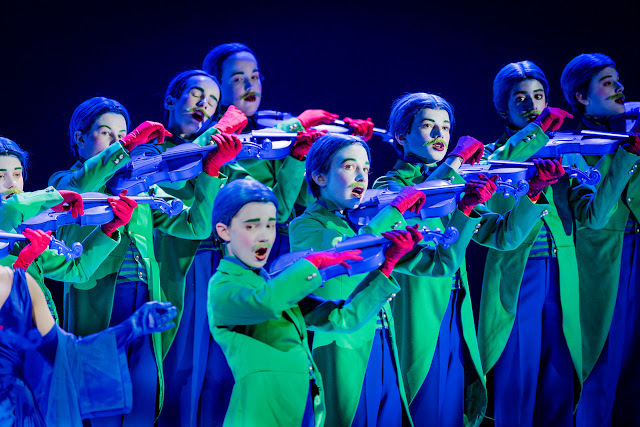 Indeed, although I am far from a paid-up admirer of this opera, I found myself, until the third act at least, fascinated at the interplay between local colour and atmosphere, broadly construed, on the one hand, and that rather sinister build-up of mechanistic forces on the other. None of that, of course, could have been achieved without the excellent understanding of the ENO Orchestra. The cast proved excellent too, with no weak links: a testimony to fine casting as well as to fine performance. 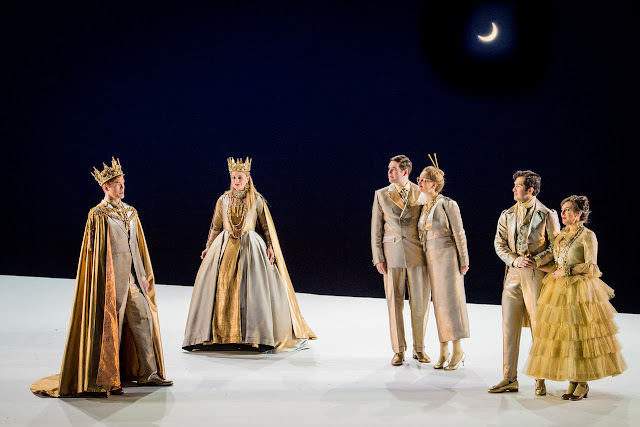 The quartet of lovers – Clare Presland, David Webb, Matthew Durkan, and Eleanor Dennis – was handsome in every sense, as vocally refined as impressive of stage manner. One really felt – which is surely part of the point – that one would have been happy with any conceivable outcome to the madness of the forest, and would not necessarily have minded being included oneself. Christopher Ainslie and Soraya Mafi made for an equally finely sung, nicely contrasted king and queen of the fairies, attended to by a properly rascally Puck (Miltos Yerolemou) and outstanding Trinity Boys’ Choir. The rustics and temporal monarchs all had much to offer too. Were I to name them here, I should simply be repeating the cast list above. 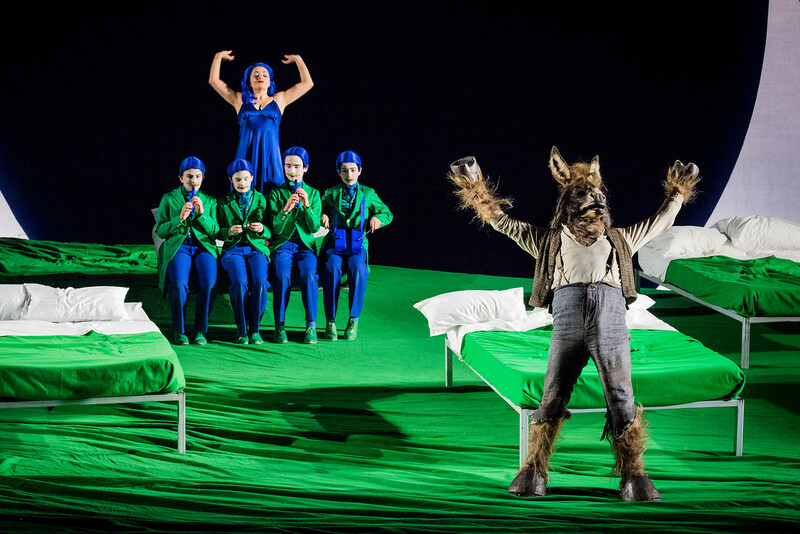 This was the sort of company performance for which ENO used to be renowned; I hope that it will now continue to be so. And yet, and yet… you may have felt a ‘but’ coming. If so, your instincts did not err. For Carsen’s production has returned at the expense of Christopher Alden’s brilliant 2011 staging, quite the best I have seen. It did what those of us less suffocated by the post-Britten English musical establishment, more open – like the young Britten, aspirant pupil of Berg – to artistic developments beyond these grey shores, would have thought obvious, yet seemingly no one had dared previously attempt. The sexual darkness not only of Britten’s past and present, but also of this work, was tackled head on, in a boys’ school setting that left one in no doubt there could be no happy endings here. By contrast, chez Carsen – and however unfair the retrospective comparison – everything is a little too well-ordered in its fantasy, a little too blithe in its heteronormativity, a little too distant from shadows of power and the abuses that accompany it. There is no reason in principle, of course, why there should not be room for both approaches, and indeed for many more. Whether, however, we should be papering over awkward cracks specifically now, in the age of #metoo, the Jimmys Savile and Levine, et al. is another question. I never cease to be amazed quite how lightly Britten gets off in this respect, but that doubtless tells its own story or stories. Not that I am suggesting we need necessarily always sit in judgement: a large part, after all, of the role of drama is to explore, to tease out. A dramatic work is neither a court case nor a treatise. There is, though, surely far more to A Midsummer Night’s Dream and its ideological framework than is acknowledged here. I hope the decision not to revive Alden was not taken because ‘traditionalists’ and those in positions of power – often one and the same – were ‘offended’, or running scared. Perhaps, then, next time, might we return to Alden, or see something with insights altogether new?